The number of sea turtles coming to inland areas in Núi Chúa National Park in the south-central province of Ninh Thuận has decreased, according to the national park management board. Sea turtles return to the sea in Núi Chúa National Park. The national park is home to Thịt, Hõm and Ngang beaches, where sea turtles regularly lay eggs. Apart from Côn Đảo National Park in Bà Rịa-Vũng Tàu Province, the beaches are some of the most important sea turtle nesting grounds in the country. In 2016, the Núi Chúa National Park recorded 73 instances of sea turtles coming to the areas to lay eggs, digging 24 nests. More than 1,500 baby turtles were returned to the sea. Last year there were only 21 instances in which turtles laid eggs. Turtles dug 10 nests and 681 baby turtles were returned to the sea. As of August 2018, there have been only 12 instances of egg-laying this year, with six nests. Three species – green sea, hawksbill and loggerhead – historically lay eggs in the area. But in recent times, only green sea turtles have been seen. According to the management board of Núi Chúa National Park, climate change, prolonged sunshine and droughts have reduced the humidity of the sand, making conditions unsuitable for turtles to lay eggs. Nguyễn Sĩ Hùng, head of the park’s sea preservation division, said that destructive fishing activities such as using dynamite, toxic chemicals and coral mining seriously affected the living environment of sea turtles. "Turtles can be suffocated in fishing nets. Egg-laying areas and sea turtles’ feeding sources have been narrowed by construction work," he said. Since 2000, the Núi Chúa National Park, with assistance from World Wildlife Fund, Global Environment Fund and Institute of Oceanography, has conducted projects to study the egg-laying habits of sea turtles, aiming to develop egg-laying area protection plans and conduct sea turtle rescues. A sea animal rescue centre was built to save and treat turtles that are trapped or caught and return them to the sea. 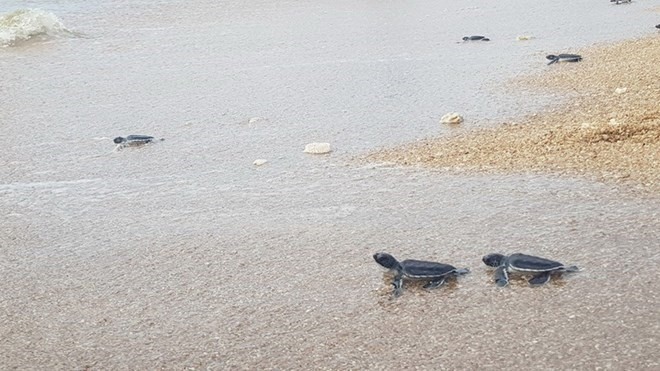 Local residents have volunteered to protect turtles by taking part in training courses on how to protect baby turtles from being destroyed by natural disasters and how to protect eggs from tide waters. The national park is working on building a network of areas in Việt Nam which can receive and save sea turtles. The People’s Committee of Ninh Thuận Province has ordered relevant sectors to supervise the activities of transporting, keeping and selling sea turtles and their eggs. Tourism agencies and Núi Chúa National Park must ensure that tourist visits to the egg-laying areas will not affect animal protection work.